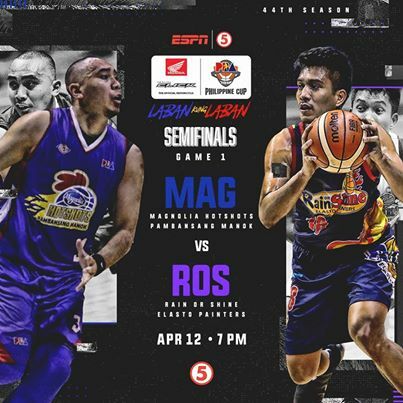 Here are the details for Rain or Shine Elastopainters vs. Magnolia Hotshots in Game 1 of their best-of-seven semifinals series in the 2019 PBA Philippine Cup. Rain Or Shine beat Magnolia, 84-77, in Game 1 of their best-of-7 semifinals series. Rookie Javee Mocon was named as the Best Player of the Game with 15 points and 10 rebounds. Beau Belga added 12 points, 6 rebounds and 3 assists while Gabe Norwood contributed 11 with 8 boards for the Elasto Painters. Paul Lee, who missed all of his seven 3-point attempts, led Magnolia with 15 points. The Elasto Painters will try to take a 2-0 lead on Sunday, April 14. Watch the game highlights as the Rain or Shine Elastopainters defeated the Magnolia Hotshots, 84-77, in Game 1. The Elastopainters leads the best-of-7 series, 1-0.